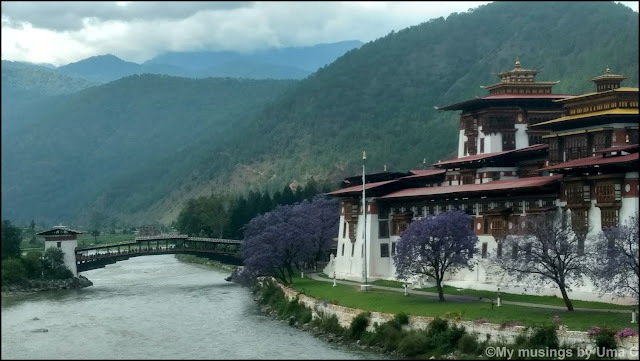 Punakha would be the most scenic places we visited in Bhutan. We left Thimpu after breakfast for this valley which was about a 3-hour drive. Our itinerary suggested we leave before dawn to catch the sunrise at a breakfast point on the way. 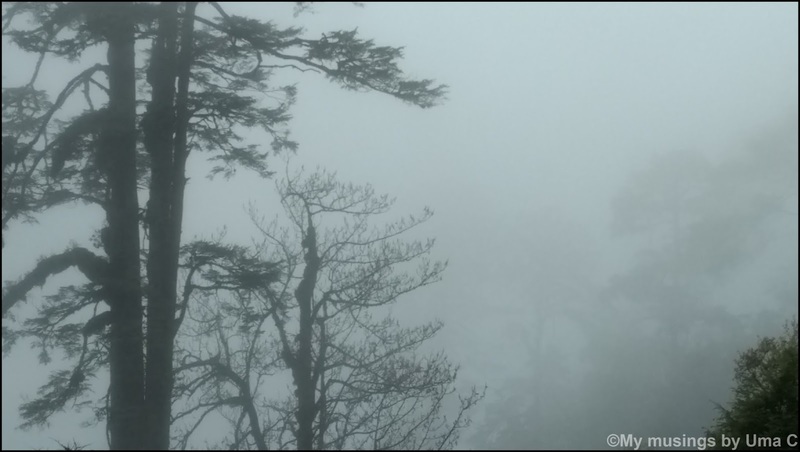 However, since it had rained the previous evening, it seemed futile to clamber out of beds and the cozy hotel with kids in tow just to see the thick clouds descending over the far away mountains. The roads all over are well-laid and except for the drive from Phuentsholing to Thimpu, the travel time for the rest of the tour did not span more than four hours. The drive around the winding, hilly lanes of Bhutan is sheer poetry. All along the way, you'd be accompanied by mountains in varying shades of green. The vegetation covering them is so dense that you can't see an inch of the Browns. These are punctuated by deep valleys every now and then. The crystal clear fresh rivers flowing through the passes are a refreshing sight and you never tire of taking in these chaste sights. 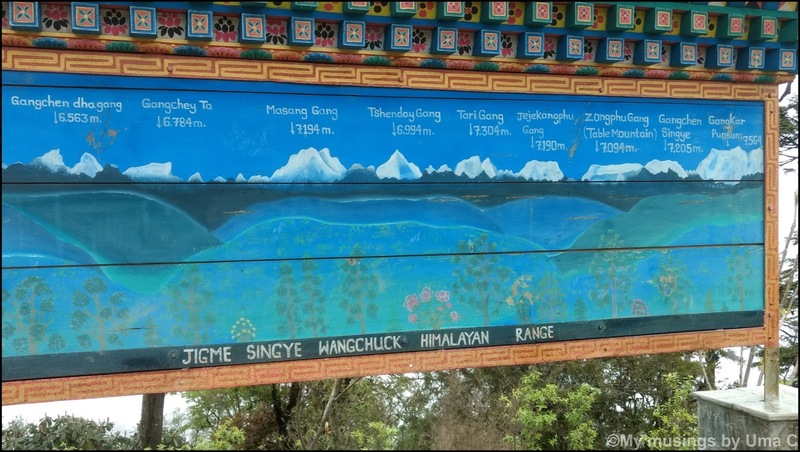 We stopped by at Dochula pass, a peak at an elevation of about 3000 meters or roughly 10,000 ft above sea level. On a clear day, one can view the snow-capped peaks of the Himalayan range from this point. This was where we were supposed to halt to view the sunrise. And, we knew our decision was not in vain because even at 10 am, we couldn't view past a 50-meter radius because of the thick mist all around. The constant chilly breeze lead us to bury ourselves deeper into our jackets. Here's a snapshot of the heights of the peaks that can be viewed from here. That's a lovely little cafeteria at the pass where you can stop for breakfast/lunch or snacks. 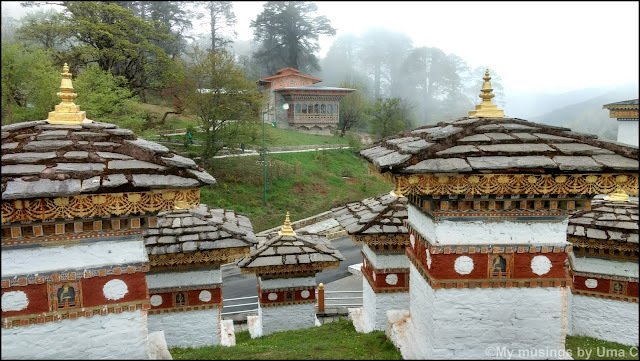 These are the Druk Wangyal Khang Zhang 108 stupas or war memorials also known as Chortens of victory. 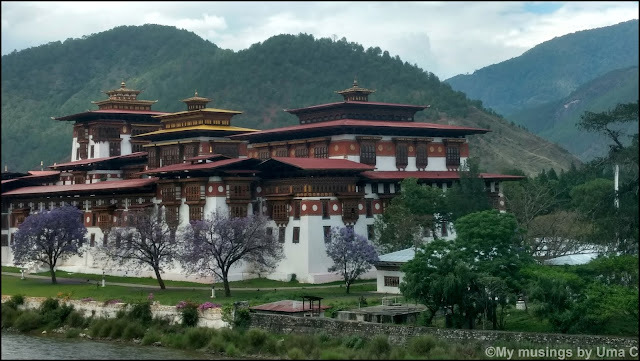 The pic below is of the Druk Wangyal Lhakhang or monastery that was built to commemorate 100 years of monarchy in Bhutan. 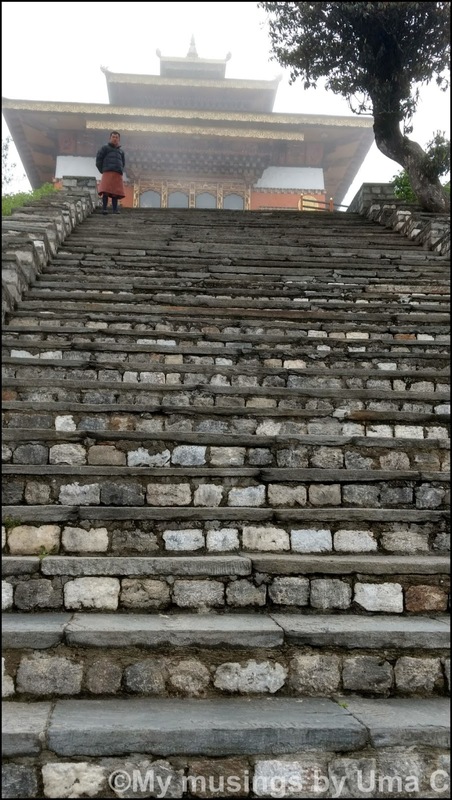 As we embarked to climb these steps, we were stopped by the guard up here who forbade us to venture any further. Taken aback, we turned to find another guard at the landing where we stood and asked why we were being stopped. He mentioned that the Queen (the wife of the fourth king) was visiting the monastery presently and we needed to wait until she left. Wow, the Queen! We asked if we could wait and see her. To our surprise, he nodded his head in affirmation and asked us to step aside. His only request was that we shouldn't click any pictures of Her Highness. Of course, we were only too ready to comply. After about 15 minutes of waiting in childish anticipation, we saw her descending the steps with just a couple of guards and a Lama who accompanied her. We waved out to her and bowed with a namaste which she graciously responded to and also wished us a pleasant stay. Buoyed by this unexpected pleasant turn of events, we continued our journey onwards. The Punakha Dzong was a bewitching sight that held us in awestruck wonder. 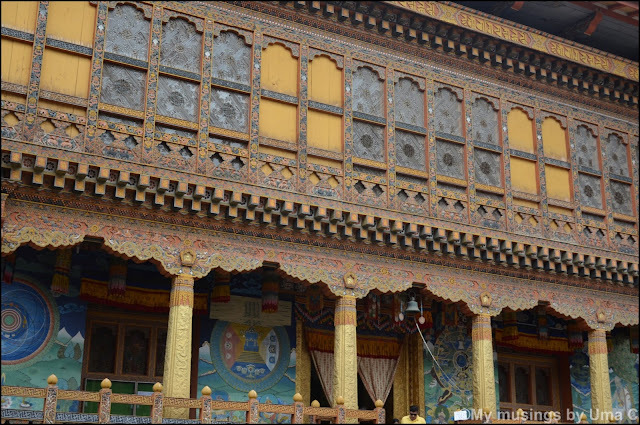 The Dzong is one of the oldest and the most beautiful ones in Bhutan, we were told. The latter part is easy to believe. Situated on the banks of a river, this gorgeous Dzong or fortress stands against the backdrop of the lush green peaks. 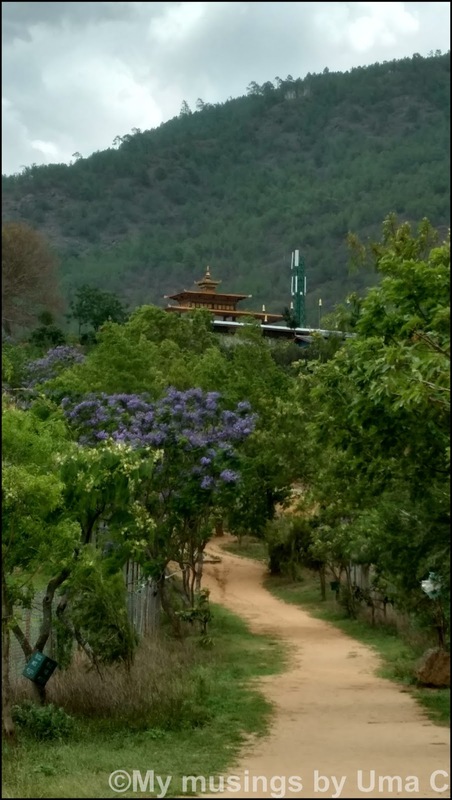 A line of Jacaranda trees in full bloom dots the boundaries of the Dzong. The Dzong is also considered important in the history of Bhutan. 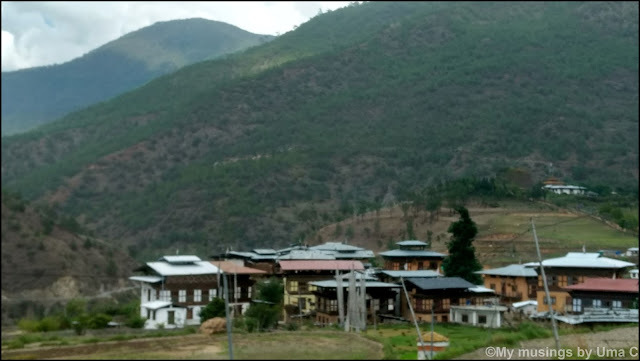 It used to be the seat of administration when Punakha was the capital of Bhutan. The recent king was coronated at this fortress. 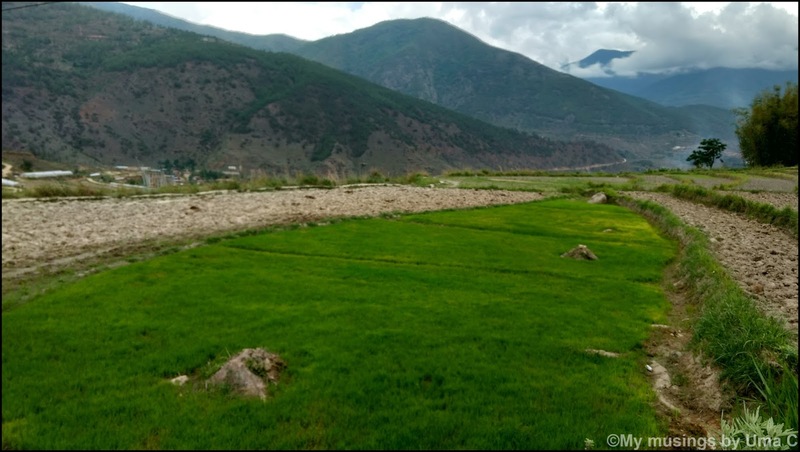 The Mo Chhu and Po Chhu rivers that up until this point flow as separate rivers from Tibet converge here and here on flow as one river down the Punakha-Wangdue valley. Mo means mother and Po means father. Chhu means river, hence the names. 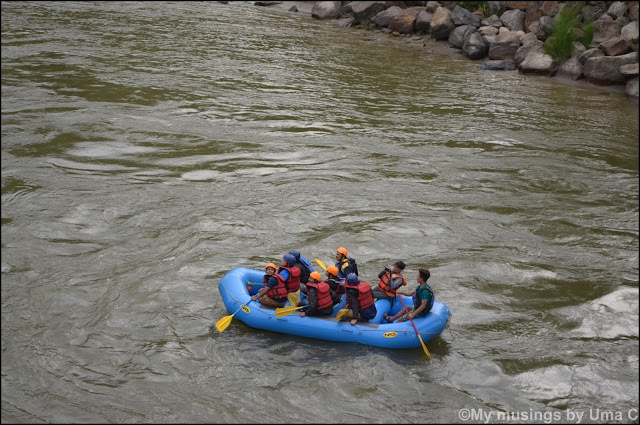 True to their names, the flow of the Mo Chhu is far gentler and less dangerous than the Po Chhu making it suitable for water adventure sports like white river rafting. 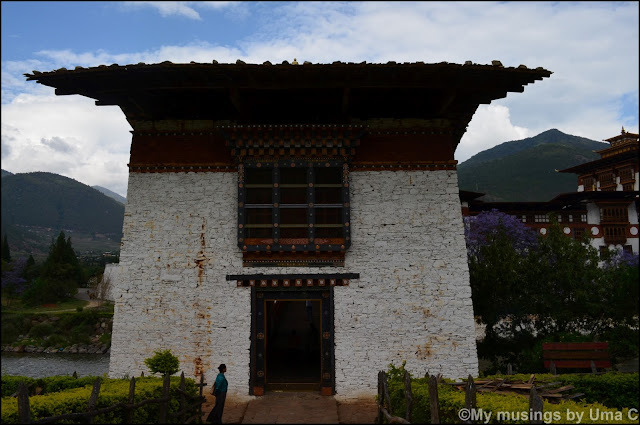 We found a guide inside the Dzong who gave a brief about the history and significance of the place. There's a Buddha temple (the picture below) within the Dzong (as is the architectural norm of Dzongs) where the entire life history of the Buddha is depicted through paintings. Our next stop was at Chimi Lhakhang. 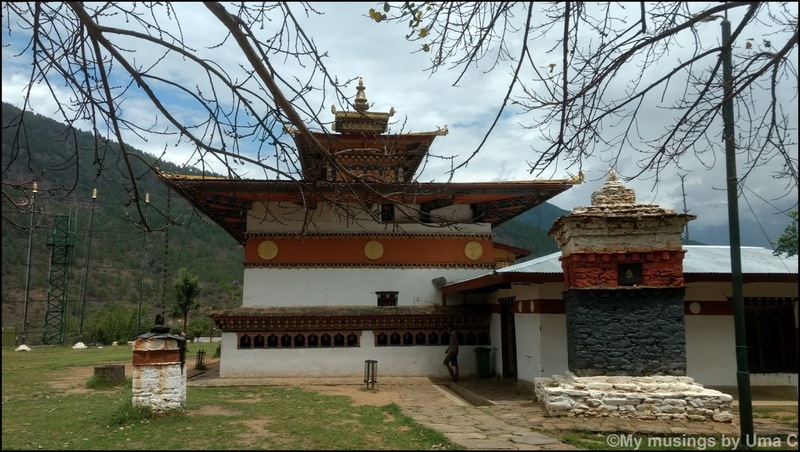 Literally translated to No-dog, this monastery was built by a Lama, Drukpa Kuenly who was known to practice Buddhist teachings in an unorthodox manner. He was also known as the Divine Madman. The temple is known to bless people who are battling infertility, hence it is popularly known as the fertility temple. It was a refreshing one-hour walk (up-down) through green mustard and paddy fields to this temple. It had been a fairly hectic day thus far. 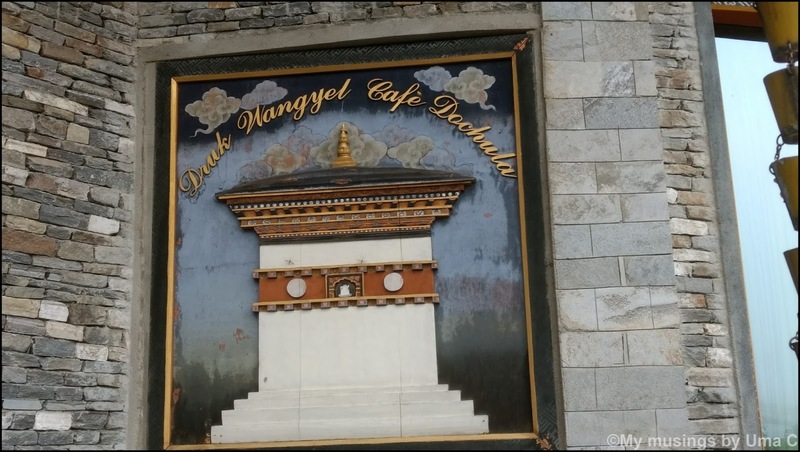 We had spent a great deal of climbing and walking around the Dzong and later at the Chimi Lhakhang. We were famished after we were back from the fertility temple and devoured the freshly-cooked food at a homely guesthouse we stopped by. The weather just doesn't allow you to feel lethargic for too long. 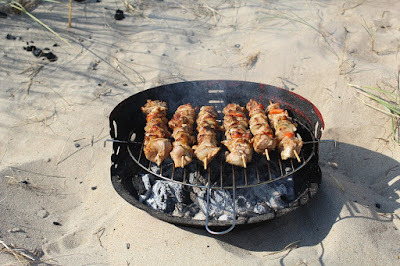 Our energy levels were restored with the short lunch break which was well past the usual lunch hour. 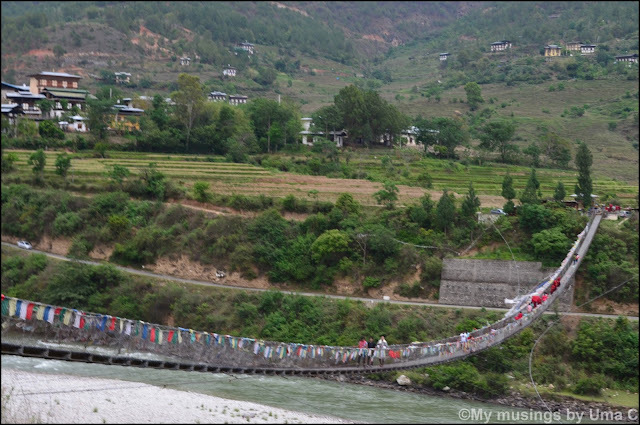 Just before we checked into our hotel that evening, we visited this huge suspension bridge and walked along the stretch. It was an amazing experience to walk on this iron swing bridge with the river gushing below us and the vast cloudy skies above. The gusty winds lent a thrill to the entire experience and we giggled like school kids as we strolled over to the other side. We met a group of monks (below) at the other end. We checked into our hotel that evening, our hearts filled with an explicable sense of satisfaction and happiness. Next stop is Paro and the travelogue is soon coming to an end. I've been trying to jot down most of the events as they occurred. Hope you enjoyed reading this. Oooh it looks picturesque - the clouds and mist and the greens. That suspension bridge is impressive, a little scary though. Were the children okay with the height and the winding roads? No mountain sickness? 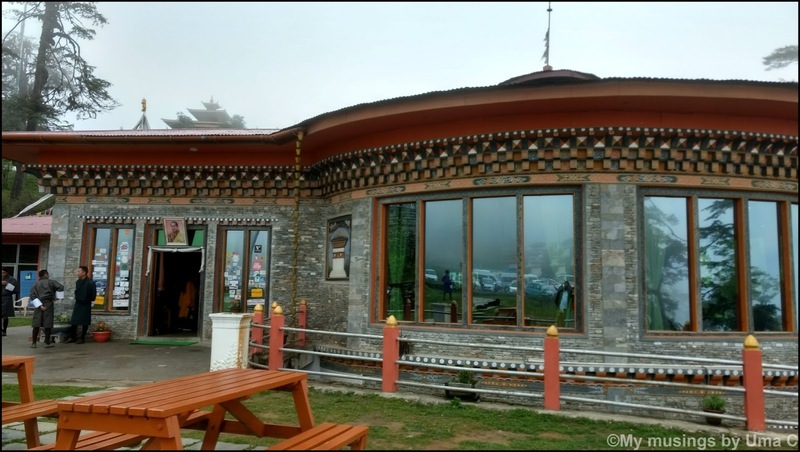 Recently I met a friend who had lived in Bhutan for a while and having read your previous post I could show off my gyan about their cuisine. So much fun that was! :-). The picts are so stunning. I love those purple trees everywhere. Seriously, it is giving me ideas. This is fab! 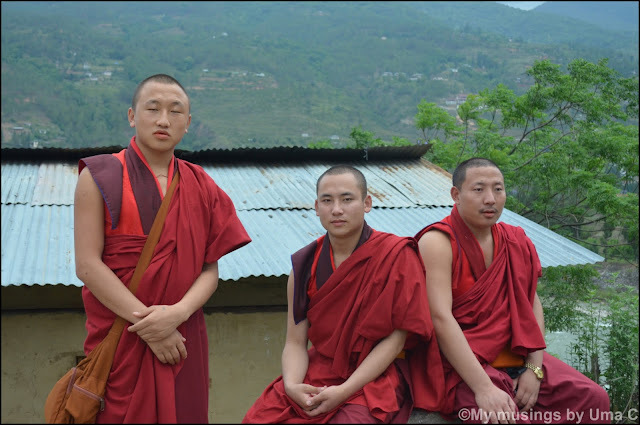 My husband was posted to Bhutan for a couple of years and he swears that it is a beautiful place with beautiful people. Well, he was there before our wedding and I am yet to visit the place. Glad to know that you had an awesome time there. The pictures say so! MO Chhu river does look calm.. Unlike our very own Rishikesh!!! 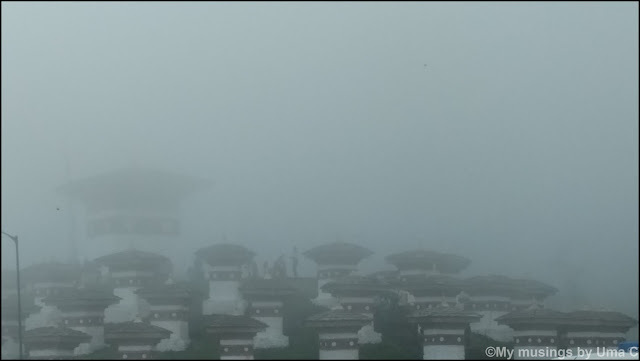 Punakha is indeed such a beautiful place..... Cant wait to visit Bhutan!! Ah so beautiful! 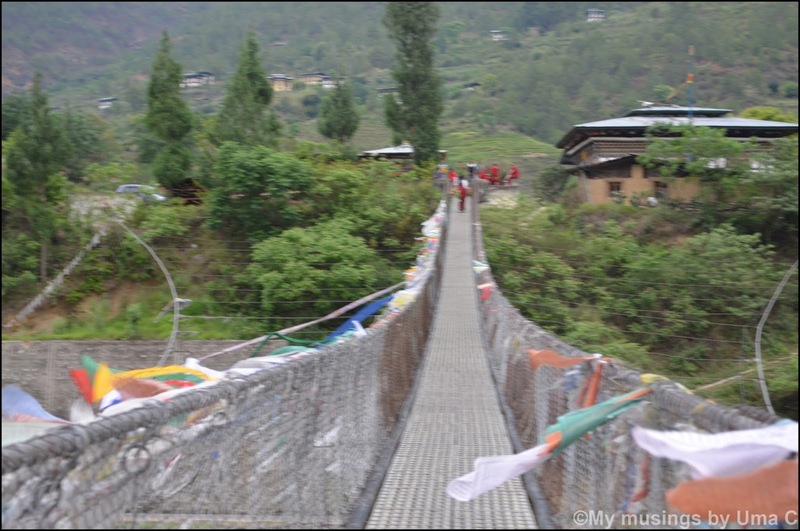 Bhutan has always been on my travel bucket list and this post has made it go a few steps higher. Yay, glad to hear this, Sowmya. Hope you go there soon!